Halloween is just around the corner and all the shops are full of gruesome goodies and costumes. It always reminds me of the lovely memories of being an excited child going out trick or treating with my sister and friends. 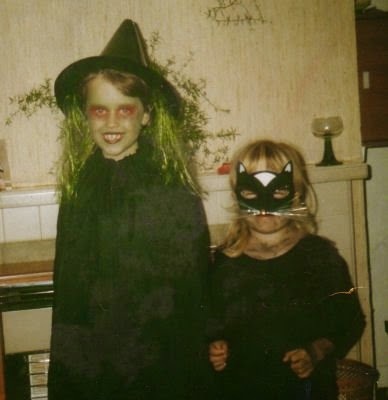 Back then their wasn't that many costumes out and about and every year I would dress up as a witch and my sister Anna would be my black cat. I actually found this photo of us both dressed up ready to go out. I must have been about eight years old and my sister would have been about five in this photo. One of my favourite memories, which actually was bad for us but is now so funny, was that one year we got all dressed up ready to go out and decided to go to our next door neighbours house first. We knocked on the door and the teenage son answered the door. We said "Trick or treat?" like you do but in actual fact if someone had turned around and said "trick" we would have looked silly because we never had a trick up our sleeves. Anyway the son told us to wait and he would go and get us some treats. We waited on the door step. Next minute the teenage daughter opened the upstairs bathroom window and threw a bucket of cold water on us. At the time we were so upset and my mum was annoyed because it meant we had no costumes to go out in but now I can't help but laugh about it. Another favourite memory was organising a Halloween party for all us friends in the neighbourhood. I must have been in my early teens at the time. My sister Anna, her best friend Katie and I spent all day organising it with lots of random games. We hid sweets all the way up the back lane for a treasure hunt. A young boy at the top of the road noticed what we were doing and went and ate most of the sweets before our friends had even turned up. We had ring doughnuts hanging on string from the washing line and the other children had to try and eat them off without using their hands. We made a shoe box into a tasting box. You had to put your hand in each little compartment and then lick your hand when blindfolded and guess what it was. I can remember Julia put her hand in and smelt the mustard and refused to put it in her mouth. Our other great game was apple bobbing but straight after you had bobbed for the apple you had to then go on to the next plate which was covered in flour and find the Parma Violets with your teeth. I will never forget Katie's sister Sam going first and almost being sick as she had a face full of flour. It was such a fun party. We used to be so creative and have so much fun in those days in Ringswell Gardens. These days Halloween is in all the shops and you can get some amazing costumes and make up for really reasonable prices. Here is a picture of my niece Lilly a few years ago as the Corpse Bride. My sister did the make up which I think was amazing and scary. I don't have kids but still get in the spirit of things by dressing up our dog Shortie for when the Trick or Treaters come around. 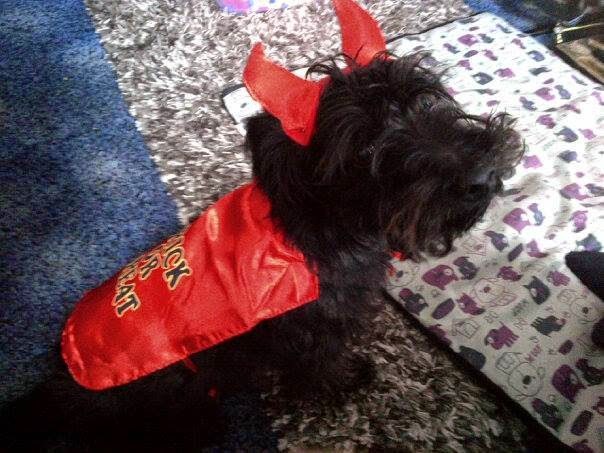 Here he is in his little devil costume. And finally I wanted to share this funny YouTube video that makes me laugh so much. Basically Jimmy Kimmel challenged parents to pretend that they had eaten all their kids Halloween candy and to video it and to send to him. It's a bit mean but very funny. I thought it would be a lovely idea to do a little giveaway to win some spooky sweets. 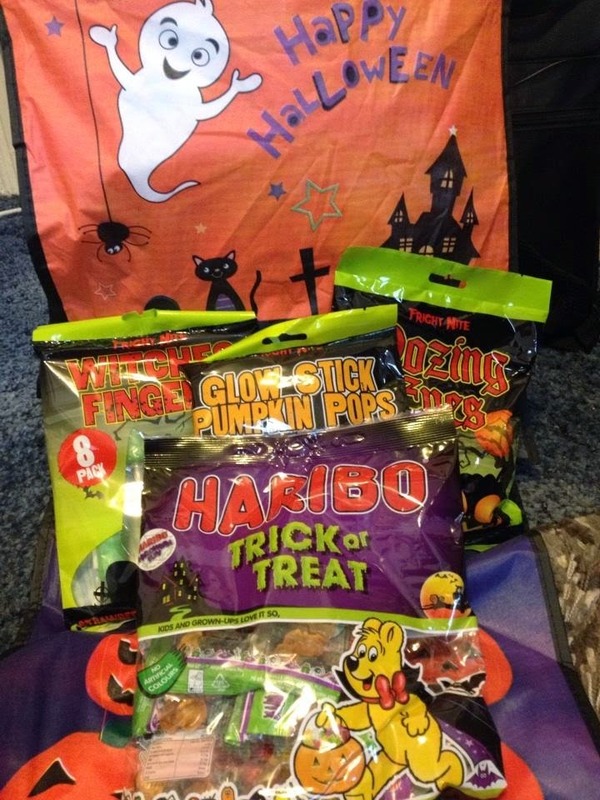 The winner will win the following: a bag of Haribo trick or treat sweets, a bag of oozing eyes sweets, a bag of witches fingers lollipops and a bag of glow stick pumpkin pops and they will come in a lovely Halloween bag. One of my memories was buying a pumpkin, cutting a face into it, lighting a candle and inserting into the pumpkin and then leaving it outside the front door, to burn away through the night. My mum always used to carve us turnip lanterns then use the leftover turnip to make Halloween broth! I now do the same for my four kids! I have darth vader and a stormtrooper and a teenager who refuses to dress up this year!! Remember when I was young going around the doors saying Happy Halloween. No-one used to dress up then. Just used to take our lit up Pumpkin around( candle stuck in the middle). Wouldn't be able to do that now with all the health and safety. I remember a fantastic halloween party myself and the kids went to at the karate club. The range of costumes was amazing and the show put on by the blackbelts was incredible. A memory of mine was when my son who was about 3 at the time got so excited about trick or treating he forgot to put his shoes on !!! I remember when I use to go trick or treating and dressing up as the Devil once and ghostface once. My Halloween memories are of trying to keep out of sight of trick or treaters knocking on the door! A crafty but tight neighbour chatted to us for 10 minutes whilst trick-or-treating and after we said goodbye realised they had distracted us from asking for treats so we ended up walking away empty handed! A witch and a skeleton! The first time we ever knocked on a door we shouted "Trick or treat?" and the lady who answered said "Oh thank you - I'll have a treat please". We didn't know what to say to that! My daughter is dressing up as Elsa from Frozen! I can recall as a youngster that we could dress up, and go 'galotions' (entertain the neighbours with songs and jokes). We went with family members and or friends. It was friendly, fun and entertaining. My Mum has always enjoyed children and/ or adults visiting and performing this custom. We now seem to have a revival :- Possibly influenced from America 'Trick or Treat'. Our youngest has been :- Dracula (had just recently 'cut' first tooth), Tigger and Cookie Monster. Yet to hear the costume choice for this year. Parties are popular, and can be suitable for all ages. Fun. My little one is dressing up as a scary Mummy! They are going as Witches! Mine are dressing up as a skeleton and a dracula. For my daughter - not sure if this comment registered before! My favourite Halloween costume was always a scary clown - I was all about the multi-coloured wig. I remember trick-or-treating around the local university campus... My friend's dad lived there as he was a lecturer. I wasn't normally allowed to go trick-or-treating so this was a special exception! I remenber going to a Halloween party when I was little and forced to do the apple bobbing which I hated.I hate putting my face under water,I think it scarred me for life! we loved bobbing for apples this was the 1960s and water always ended up everywhere with my mum shouting watch the carpet! As a spider - a very cute spider! being blindfolded at a party, and made to plunge my hands into cold spaghetti (guts) and search for eyeblls (pickled onions). I was traumatised for weeks. 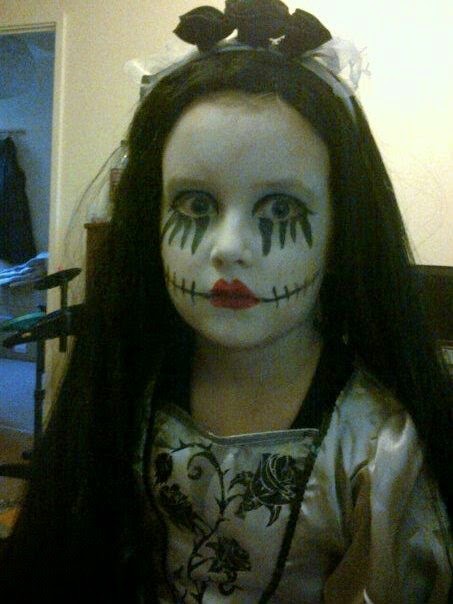 My daughter always has to be a princess so I will try to persuade her to be a zombie princess. I remember cutting holes in a good sheet so I could be a ghost - My Mum was not impressed ! My daughter is going on her very first Brownie camp this Halloween! My sisters birthday is near halloween and she always had a halloween party, I remember a lot of bin bag costumes! I remember dressing up as a black cat and going trick or treating with my cousins. My Daughter wants to dress up as a bat! Kids now have such great costumes, ours were made with stuff like black bin bags when I was little but we had such great fun. We will definitely have a pumpkin his year, we do a different face every year. My Halloween memory is going to a Brownie Halloween party! Mines dressing up like a zombie from The Walking Dead! We don't really do dressing up. We always try to take Samuel out somewhere with a Halloween event on during the day. Shes going as a dragon! I don't have any children but my cat would make a good witches cat, she is all black with a bit of white under her chin. Except she's a bit of a porker so the brromstick probably wouldn't be able to get off the ground! My son is an old school vampire - Dracula himself, he looks so funny and cute! Daughter will be a witch and my 2 year old son will be her black cat! My children are dressing up as chucky and bride of chucky. Not that they know who they are but they will look brilliant! I remember going trick or treating! My daughters are dressing up as a witch and a witches cat. My daughter is dressing up as a zombie and my son is a spider. The other two haven't decided yet. Watching 'Salems Lot' with friends and having to leave because I was frightened to DEATH!! Have not watched a horror Film since! we used to have great partys,i remember the fab cake i made for halloween,every one talked about it. Little one dressed as The Mummy one year, great fun! I lived in America for a year, and they do Halloween so much more than us, people kit there whole houses out and I found some a bit scary, so god knows what the kids thought!!!!!! My girls are a witch and a vampire, my boys are a ghost and a zombie! My son is not wearing a costume as such but a Jack o'lantern t-shirt and some starry joggers. I went trick or treating as a blueberry once. My daughter is usually a little devil but has grown out of her costume so she's going to be a pirate this year! I remember the disappointed look on the faces of the children who knocked at my door unexpectedly trick or treating a few years ago. I'd forgotten about Halloween and had nothing in the house to give them. I scrabbled around in my purse and gave them what change I had, which wasn't much. They'd gone to a lot of trouble and had beautiful costumes. I felt very guilty and have never forgotten to get some treats in since then. youngest has got me making her a vampire outfit with very specific ideas on how it has to look! My sewing machine has never been so busy! My two sons will be dressing up as Darth Vader and Darth Maul and my little girl is a 'pretty' witch! My daughter doesn't like halloween. A few years ago, my partner opened the door with fangs in, long coat on to a little ghost. The boy said, are you friends with Vampire Bill? Yes, said my partner, ahh, so you are mainstreaming too then. Yes, that's right. Handed out some goodies and shut the door. It was only a very little ghost, he shouldn't have been watching True Blood! My son will be some sort of monster! I remember covering a neighbours garden with toilet roll because they wouldn't answer the door! I remember dressing up as a witch and going to Pendle Hill ( infamous round these parts for the Pendle Witches ) with my mum as a child, my cousin was a skeleton and my brother was Dracula, we had our photos taken for the local newspaper and my mum still carries the picture in her purse now some 25 years later!! my friend moved here from south africa and when we where younger she had a halloween party at hers, her mum had put out all sorts of weird & wonderful foods that id never tried very odd south african dishes and cured meats or something. and her brother frightened the poop out of us! he hid in the bedroom upstaries and every time he heard someone go upstairs he jumped out at them (different doors each time with various masks and things. A little devil, which is quite fitting for her terrible two stage! My son is dressing up as a skeleton. A Witch my kids say I am well suited!!! My daughter Gracie is being a little witch. I have no kids...but I'll be dressing as a zombie for the party we're hosting! my 3 year old is desperate to be a ghost - now where's that sheet!! I once dressed up as a Pritt Stick for Halloween. Seriously.